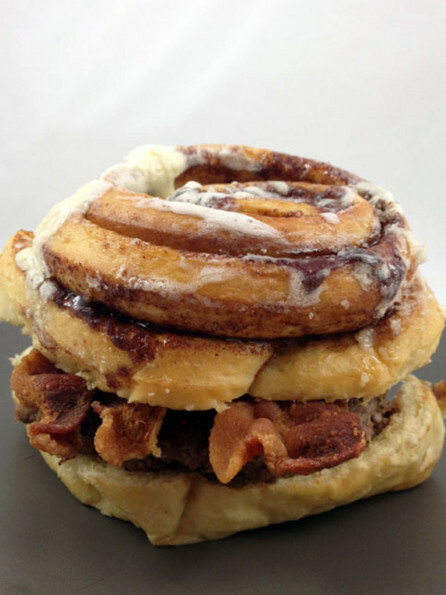 The Cinnaburger is a glorious creation that combines the meatiness of a burger with the sweetness of a Cinnabon serving as the bun. It was made by Nick of DudeFoods.com. You might remember Nick for his Lasagna Burger. Or if you’re me, you are convinced he’s the incarnation of that little devil who sits on my shoulder and whispers things like “Go for secondssss!” and “Cheetos would go GREAT on this ice cream.” Then again I’m currently on some serious hallucinogens, so… just take everything I say with a grain of salt.